The campground is on the southern edge of London, Kentucky. It is just a few more miles into the main part of the park and the Mountain Life Museum. If you have any interest in the tools used in early pioneer life, then the museum at Levi Jackson State Park is the place to be. There are all sorts of household and field tools on exhibit! It adds a touch of education to park. The kids may not even realize that they are learning. Another aspect of the park is the 8.5 miles of hiking trails. Boone's Trace and Wilderness Road were used by thousands of people who traveled from Virginia to Kentucky and other areas of western expansion. Now, visitors can hike portions of those same trails and literally walk in the footsteps of the pioneers. That's always pretty cool to me. Levi Jackson State Park in Kentucky is more than just history. Camping, hiking, wildlife viewing and other outdoor recreation opportunities are available in the park. There is also an 18 hole miniature golf course, swimming pool with water slide, basketball and volleyball.courts. Our visit here lasted only a couple of hours. We couldn't stay as long as I would have liked but it was a good summer afternoon break. 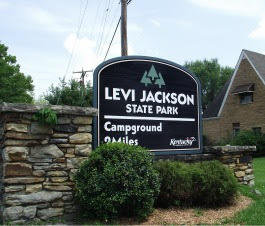 The Levi Jackson State Park website also indicates that summer programs are planned for kids. Families may enjoy the visit as will couples, groups or anyone who enjoys the outdoors.